25 Autohof truck stops already offer PREMIUM Parking, and by the end of 2019 another large parkings at truck stops will emerge and certify as „PREMIUM PARKING“ along the motorway. We already have the commitments from the truck stops, and the structural arrangements are under way. By the way: Any Autohof with a truck stop can join this open system and plant their flag for better security, systematic monitoring and better control of parking areas, and better comfort for drivers and their cargos. 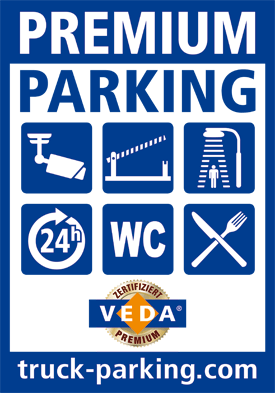 „truck-parking.com“ is an open system that will not require VEDA membership. Our common goal is to offer PREMIUM or QUALITY truck parkings along all major transport routes, and to provide drivers and carriers better comfort and security. All the partners in our „truck-parking.com“ system receive the signage PREMIUM or QUALITY Parking on the Autohof truck stop for a positive signaling effect to truck drivers – we also pursue a direct signage on the motorway itself. For the drivers, this will be their guidepost to a restful, comfortable and safe driving break.